After 3 weeks of IPAs, I thought I would change up a bit and sample some stouts. 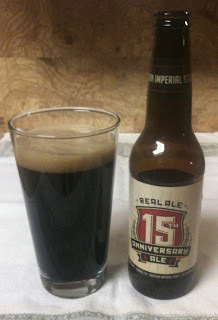 So let's start things off with a Texan: Real Ale Brewing Company's 15th Anniversary Ale, a Russian Imperial Stout. 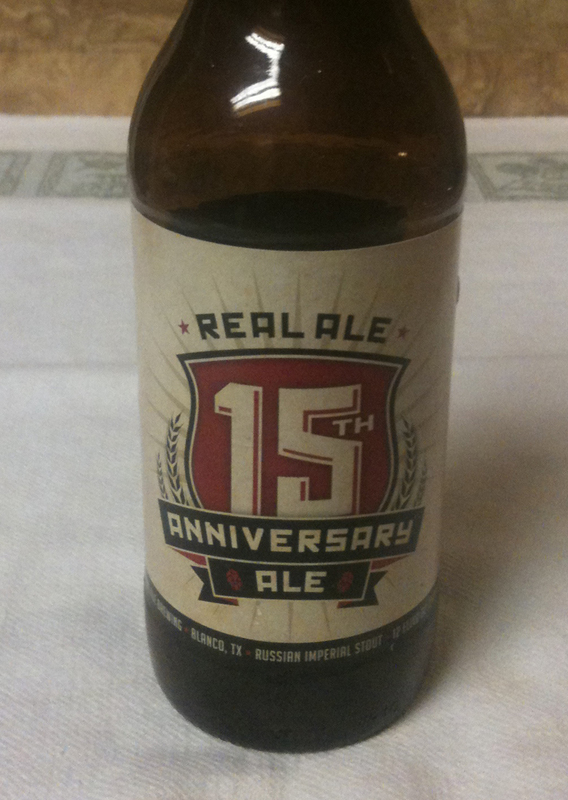 Their web site shows 9.8% ABV and 70 IBUs. Twelve ounce bottle. This stout poured with a medium head, which was a rich brown in color. The color of the stout itself is a very dark blackish-brown; you can't see any light through it even if you hold the glass up to the light. There is a nice hint of coffee to the aroma and some sharpness that you get from higher alcohol. Flavor is on the strong side, with a lot of malt. It definitely has the taste of a higher-alcohol beer, and some caramel-like sweetness. It gives you a little warmth as it goes down - a good winter beer. The aftertaste is slightly bitter.